This was an ambitious double album from Elton John in 1976. There are lots of classical influences on it - particularly in the opener, the evocative, piano-led ballad "Tonight". Even on the next track, "One Horse Town", which has some typical Elton riffage in it, it also has sweeping strings in the backing. It has an extended intro before the vocals kick in. 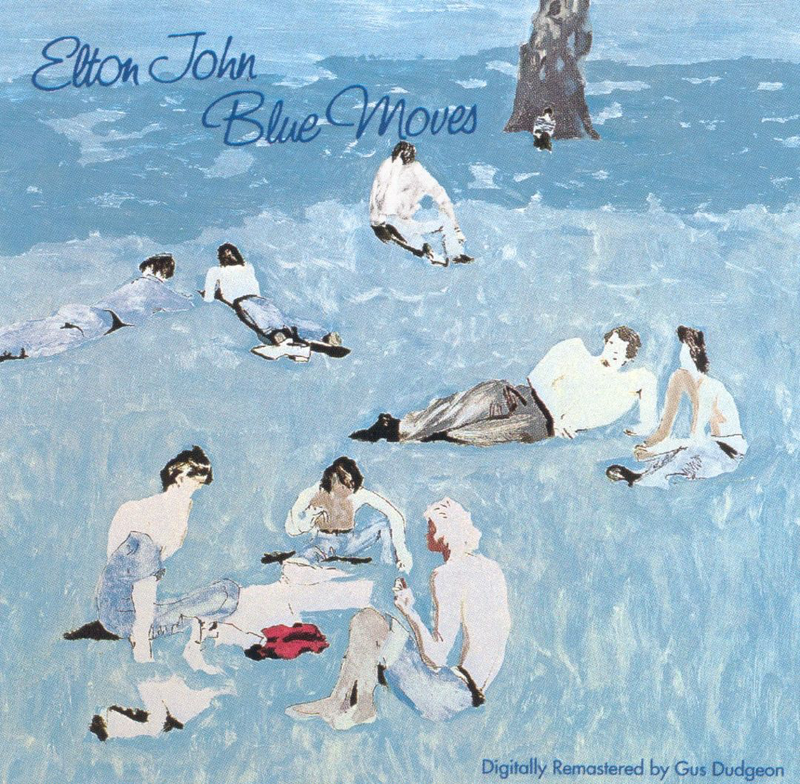 In many ways, it is an archetypal Elton seventies rocker, but it is the highly-orchestrated backing that renders it different from earlier material. This is definitely a "big production" album. The sound quality on it is superb, by the way. It has been a great start to the album, in the "Funeral For A Friend/Love Lies Bleeding" style. It almost has a "rock opera" feel about it, as if the songs are somehow linked (they are not). "Chameleon" is a beautiful, harmonious ballad with some of those moving Bernie Taupin lyrics. "Boogie Pilgrim" harks back to those "Honky Chateau" days with a powerful slab of chunky bluesy horn-backed rock. 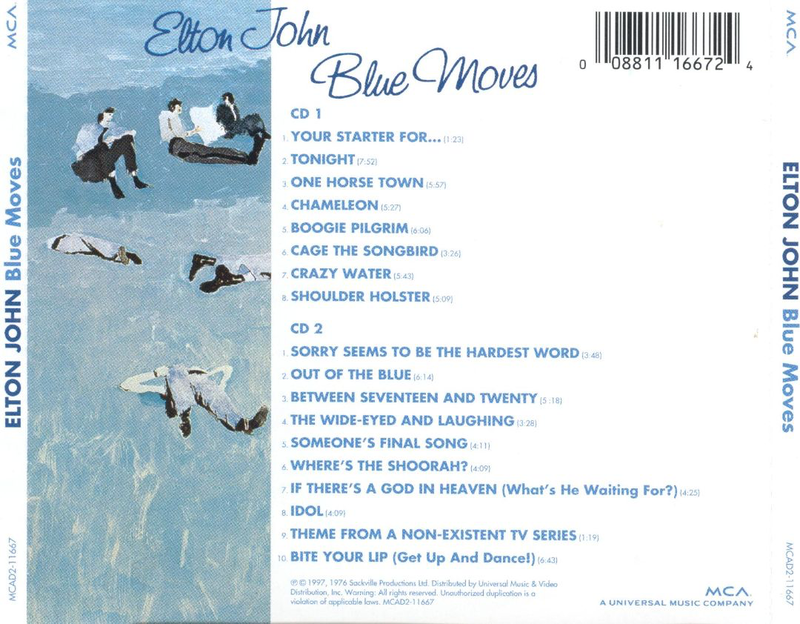 It is very representative of much of Elton's seventies output. "Cage The Songbird" is a tender ballad with definite echoes of the "Elton John" album. Elton's vocal is excellent on this one. "Crazy Water" is a rhythmic song in the "Philadelphia Freedom" mode with that same drum and funky guitar sound. The wah-wah really kicks in mid-song and most exhilarating it is too. So far, this is a pretty good album. "Shoulder Holster" is one of those Bernie Taupin songs of the old West. It is backed by a big punchy horn sound and Elton's voice is in full-on twangy style, straight out of "Tumbleweed Connection". The saxophone on it is excellent. I didn't know who played it, but upon hearing it again, I said "David Sanborn" (Bowie's "Young Americans"/Ian Hunter's "All American Boy"). I was right - it was his highly distinctive style. Then there is the iconic "Sorry Seems To Be The Hardest Word", which everyone knows. I was always irritated by Elton's pronunciation of "absurd" as "abZurd", however. 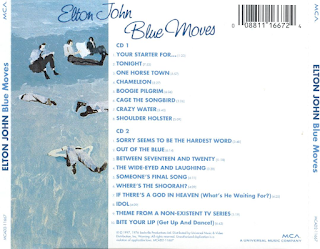 If the album had ended here, or with the TV theme tune-sounding instrumental "Out Of The Blue", (which features some great guitar) then I think it would have garnered far more critical acclaim than it did, for from here on it gets somewhat bloated. Not that the next bunch of tracks are poor, they are not, but it just felt more stodgy than "Goodbye Yellow Brick Road", his other double album, had been. "Between Seventeen And Twenty" is, nevertheless, a fine track - emotive and melodic with a soulful organ backing. Elton's voice is impressive again. It goes on a bit too long though, sort of losing some of its early potential. "The Wide-Eyed And Laughing" has some sixties-style Eastern strings and a sort of hippy, George Harrison feel about it. This is another one that has influences from the "Elton John" album on it. It doesn't surprise me that Graham Nash appears on backing vocals here, you can clearly hear him. "Someone's Final Song" is a sad farewell to a departed person, identity unknown. It is tender, sensitive and beautiful. "Where's The Shoorah" is a slow, gospel-influenced tribute from Bernie to his wife. "If There's A God In Heaven" is a slightly funky mid-paced track. It is not too bad. You know, this double album would have functioned fine as two albums, in many ways, but as one double album it doesn't quite get away with it like "Goodbye Yellow Brick Road" did. The jazzy "Idol", presumably about Elvis, only a year before his death was ominously prescient and a great track too, with more excellent Sanborn saxophone. "Theme From A Non-Existent TV Series" is a minute or so of instrumental waste of time, as indeed had been the short opener, "Your Starter For...".